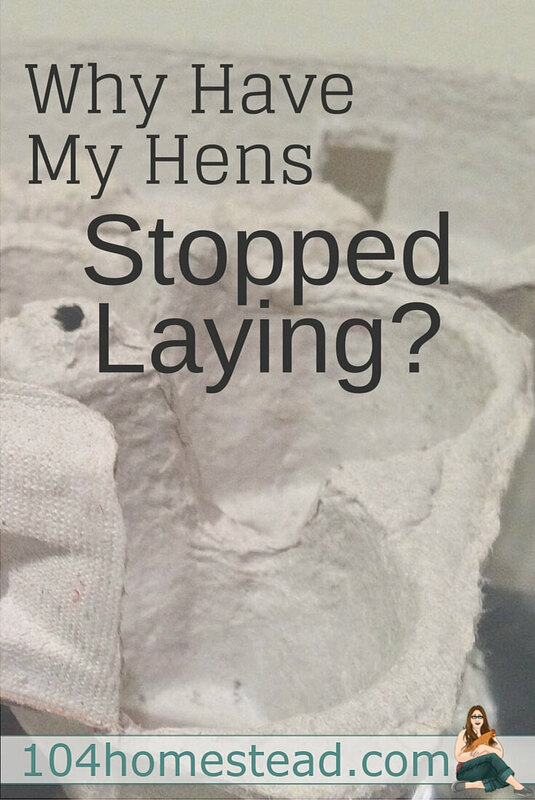 Why Have My Laying Hens Stopped Laying? The timing of this post is perfect. I got an email from a friend of mine who was so worried about her hens. This is her second year with them and she was concerned that they looked disheveled and had stopped laying. I asked her to investigate further, but with 18 month old chickens in the fall, I was hedging my bets that her hens had stopped laying for the most prevalent reason laying hens stop laying. Molt. These factors are often one in the same. As the day get shorter, hens tend to go into a molt, but often not until their second autumn. During molt, all of the bird’s energy goes into growing new feathers. For information on chicken molt, find the ins and outs of molting from Timber Creek Farmer. If it’s duck molt you’re looking for, check out Duck Molt: The Pillow Fight in My Yard by yours truly. 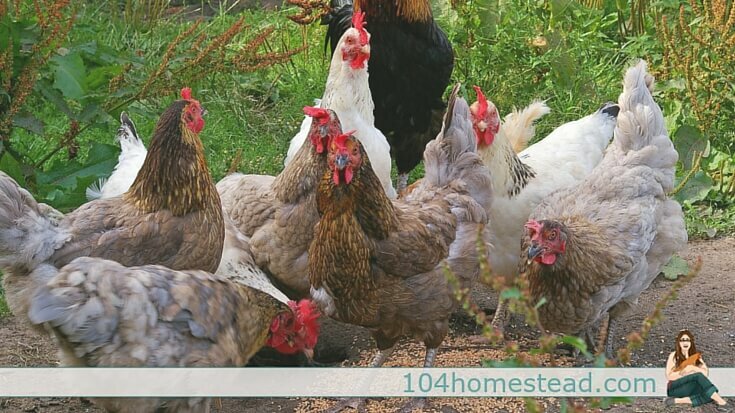 Laying hens require fourteen hours or daylight to lay at optimal levels. High production breeds may continue to lay despite the shorter days, but most backyard laying hens will reduce the amount of eggs they lay or stop completely. You can avoid molting and lack of production by adding supplemental lighting. But wait, it’s it good for the hen to molt? Laying hens in good health only need to molt every other year. During the molt years, just begin adding supplemental lighting after the hens begin to show signs of molting. Proper nutrition is essential when it comes to egg production. You may think that because you have your laying hens on a balanced commercial diet that all is well, but that isn’t always the case. I have been feeding the same commercial feed for two years. Recently the production in my laying hens dropped. I didn’t see any connection until I went to the feed store and they were out of my regular feed. I got a different mix from the same company and started feeding my laying hens the new food. Two days later, I got more eggs than I had gotten in the last few months. The trend stayed and I now feed the new mix exclusively. Another thing to take into account is the feeding habits of your laying hens. You may be feeding a top-of-the-line feed, but if you’re hens prefer to free range all day, are they getting all the nutrients they need? If one hen is being bullied, is she getting enough food to produce eggs? Spend some time observing your flock if egg production seems to be dwindling. No one likes to be bugged and your laying hens are no exception. Internal parasites such as a high worm load can make your laying hen sick. If she is sick, she wont want to lay eggs. Her body will be focused on making her well. External parasites such as mites can cause irritation, stressing your chicken. I have a big sign on the front of my coop that reads “Healthy Eggs from Happy Hens.” Stressed out laying hens do not produce eggs and if they do, they can sometimes be low quality eggs with thin shells or odd shapes. There are a number of things that may cause stress for your laying hens. Change in the flock including adding new members or somehow disrupting the pecking order. Inadequate housing that does not keep the hens dry and away from winds and drafts. Predators stalking the area or attacking the flock. Fear. 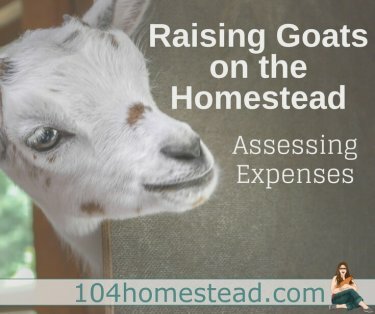 It can be fear of the neighbor’s barking dog, your child who runs through the yard picking up hens at random (I have one of those), loud noises such as construction sounds, or new additions to your homestead, be it people or animal. Your girls may have reached their twilight years, attributing to a lack of laying. Hens lay at their peak for the first 18 months, or until their first molt. Older hens will molt more often and lay less often. I have a four-year old Ameraucana who lays one egg every three weeks between the months of June and September. If may not be often, but it is the most beautiful round and bright blue egg. Make sure that your hens are not hiding eggs, you don’t have an egg eater, or a predator who is stealing your eggs. Your hens may be laying just fine and you still aren’t seeing any eggs. This is my first year with chickens that I got from Cackle Hatchery last July 2016. I bought a white giant jersey, a black giant jersey , and a buff orpington I LOVE them!!! They free range all day on about 10 acres. About 6 weeks ago a fox or coyote got my large black Giant Jersey 🙁 About 3 weeks after that I got a new pullet and quarentined her a couple of weeks. She is a german breed a Bielefelder Kennhuhn. Before I even got the new pullet my two hens had basically stopped laying. I have searched and searched but they have not layed anywhere else either. 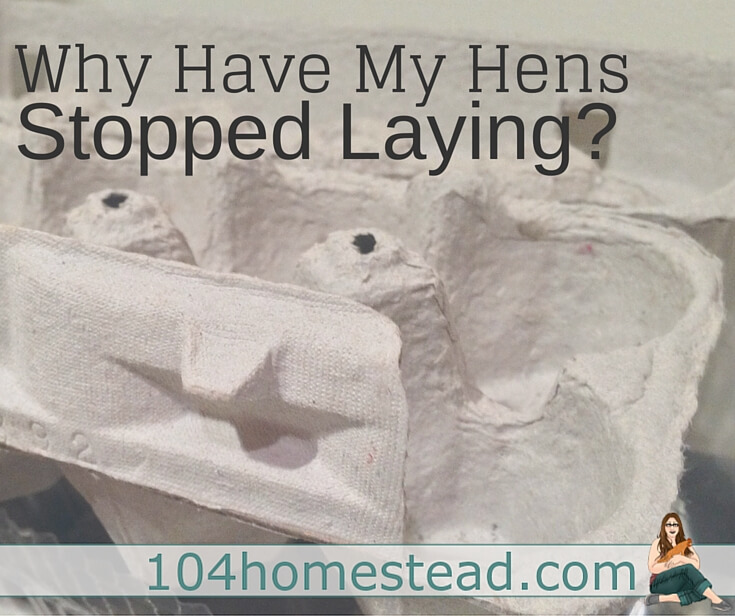 I read reasons why hens stopped laying on the internet. I added apple cider vinger to their water. Jury is still out. I also read maybe weight could be an issue. I have feed them good feed and mealworms. Maybe they are not getting enough protein? idk. Could it be trauma from losing the black giant jersey (El Chopo)? I have been without eggs for 3 -4 weeks now. 🙁 Should I add diamatacious earth to their food? If it’s mites, what would be the indicator? I have not wormed them. Would they be molting in july? I feel like it’s my fault . What should I try next? Thank you so much for your blog. I just signed up!!!! Amy, Fulton, MO. I have four Plymouth Barred Rock hens who are almost two. They stopped laying eggs while they were molting which took a long time. Since these are my first chickens I don’t really know how long that process takes. I live in northern Michigan where it gets dark very early in the fall through the winter. I put a light in there coop to help keep them warm and lay eggs. Still no eggs. I was feeding the food with 16% so I purchased a higher quality food with 20% and they started laying. At the time I was also feeding them a half can of cat food every day because my cat had to be put on a special diet. I couldn’t find anything that said you shouldn’t feed it to chickens and they loved it. I ran out of the cat food and they stopped laying eggs a short time later. We found a mouse in the coop so I thought maybe that was stressing them out. No mice and still no eggs. Do you think they need a higher protein food or is it their age? They aren’t free ranged but have a large fenced in area and some treats. Thank you! Are you making sure they are getting 14-16 hours of light a day? Less than 12 hours and they won’t lay eggs. Protein is certainly good for them, but cat food contains a lot of fat and isn’t great for your hens (especially regularly). Black oil sunflower seeds (aka: BOSS) is a great way to increase protein levels. I don’t think mice would cause enough stress to prevent laying. I have a feeling the light is the biggest issue. We have a light in there cage, in the enclosed section, should we be using it, and if so how often? Typically you want to start adding supplemental lighting in September, when the length of daylight begins to drop below 14 hours. You slowly add lighting throughout the winter so you maintain 14 hours of light. After December 21st (the shortest day of the year), you slowly reduce the light until it’s no longer necessary because the natural light is back to 14 hours. Most people add their light to the morning hours (so if sunset is at 6pm, the light is turning on at 4am), but my eggs were frozen solid with that schedule. I do mine on either side of the natural daylight so it turns on at 6am, runs until the sun has come up, turns on again when the sun sets, and turns off at 8pm. Sorry, that was probably a lot of information in one sitting. Your best bet is to continue what you’re doing for this winter since you don’t want to shock your birds with all sorts of additional light at this point, and try supplemental lighting next year. We have 4 1 year old Rhode Island Red hens. They have molted recently. …NO EGG PRODUCTION. When will they begin to lay again? We are new to this farm life and are loving it. We have named each of them.Our roosters name is Omelet LOL.We have 176 acres and they free range + get crumbles in the evenings when they go to their home and boxes (apartments) as I call them.We actually hatched them ourselves in May of 2014.We are thinking about hatching another 5 or 6.Please let me know if I can do anything else to make them more comfortable and produce more eggs. Looking forward to hearing from you. Molting typically takes 6-8 weeks from start to finish. You can add additional protein to their diet to help them along in that respect. I’m assuming since they molted that you are not using supplemental lighting, which is totally a personal choice. Even with supplemental lighting, winter means less production. Typically birds will start laying more often when we reach the second or third week of February since natural daylight hours are longer at that point. With 11 hens and adding supplemental light, I get about 4 eggs a day right now. By the end of February, I can expect 6 eggs or so. By spring I’ll be back up to 9 or 10. I have enjoyed your column on Chickens, but this is my story…… I have White leggorns that will be one year old in March and they have never laid an egg. We have them on a healthy diet, keep their pen and nest clean, let them free range when possible and still get nothing!!! I have talked to them (lol) shamed them t o no availl!!! Any suggestions? Well that is just plain odd. Especially of longhorns. Did you raise them as chicks? Age is the only thing that springs to mind, but that wouldn’t be the case if you knew for sure how old they are. Could you maybe have a vermin stealing eggs (snakes and rats and sometimes wild birds are the usual culprits)? Do you free range daily where they might be hiding the eggs from you? Let me know and I’ll keep brainstorming.